Note: Florida Bamboo is on hiatus, and we are not selling bamboo plants at this time. 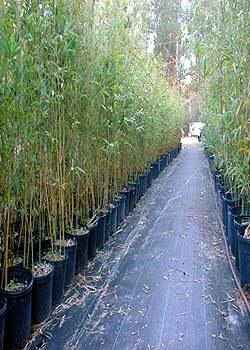 For a list of bamboo nurseries in Florida, click here. Do not expect to be "wowed" by the appearance of the small potted plants for sale at our nursery! You are paying for what the plants will turn into, not what they look like now. Our plants are healthy and are an excellent way to establish beautiful stands of bamboo in your landscape. But bamboos don't really develop their full grandeur and magnificence until they've been in the ground a couple of years. Containerized plants don't look impressive, they don't give you much idea of what they will grow into, and many species look quite similar to one another as small potted plants (whereas once they've been in the ground a couple of years, the unique characters of each type become beautifully evident). Do yourself a favor and try to figure out what kind(s) of bamboo you want before coming to the nursery. Check out the pictures and descriptions on this website, call or email us to discuss your needs. If you come to the nursery expecting to decide what kind of bamboo to get based on what you see here, the nursery plants won't help you much in deciding! We're working on planting out specimen plants in the ground of all our varieties at our new location, but it will be a couple of years before they look like much. To really get an idea of what these species will look like as mature plants, visit Kanapaha Botanical Gardens in Gainesville to see big, mature specimens in person. There is no substitute for standing under a giant, clumping bamboo, gazing upward in awe. Three-gallon sized plants will usually fit entirely within a standard passenger vehicle, especially if laid horizontally with the pots set where the front passenger's feet would be, and the tops fed back through the middle of the vehicle. When picking up either large quantities or large plants, a pickup truck works very well, if you have access to one. For very tall plants, the tops can extend horizontally out the back of the car or truck bed; if you'll be going over about 50 MPH, it's a good idea to bring a sheet and some rope to wrap any exposed tips to prevent foliage from being torn up in the wind. Our nursery is located in Citra, Florida (halfway between Ocala and Gainesville) and is open by appointment only. Call or email to get directions and to set a time to visit. We are a very small business and are extremely busy growing and maintaining our stock. Frequently, you will get the answering machine when you call, and it's sometimes as much as a day or two before we are able to respond to your phone or email message. So it's important to contact us a few days before when you want to visit. We do not ship, but we can sometimes do deliveries in Alachua County and northern Marion County. We're not yet set up to accept credit cards - cash or check are fine for payment. Feel free to contact us if you have any questions, and thank you for your interest in Florida Bamboo! © Copyright 2002-present Florida Bamboo.